There are a couple words that really hurt a mother to hear. When my youngest daughter, Jacie, was in the heart of her ‘terrible twos’ she would say, “I want a new mommy, I want a new daddy, and I want a new family”… She would yell this after we tried to discipline her because she was acting out, or doing something she wasn’t supposed to do. And well she was two years old, so there would be a lot that she wasn’t able to do. This would cause a lot of grief in our home and my husband and I were on different sides. I’m thinking she’s still a baby; she’s too young to understand discipline. My husband on the other hand, was like, “This is the time to teach her, we have to break that stubbornness or we’re going to be in trouble later”. And it makes sense, but I’m still unsure. So I call my sister. My sister had just had a baby, so she had been reading a bunch of books on how to raise kids. So I asked her which approach would work. She says, “You know, Jenny, I was watching the Dog Whisperer last night and Cesar Millan says you have to show them who the alpha dog is”. So I’m like, “You know we’re talking about my toddler, and not about a dog right?” and she says, “It’s all the same. You have to establish authority and show her who’s in charge.” Okay, I’m on board with this plan. It makes complete sense. It’s two against one, so I guess my husband was right. So we go gung-ho, full force. When she starts having a tantrum and acting out, we come out strong. We will not be broken. And it becomes our mission to break her stubborn spirit. One night, she starts again with the crying and says “I want a new family”! So my husband Jeff, takes out his laptop, and does a google search for monsters, and shows her the images. He says “Go ahead, pick anyone. They are looking for a little girl to adopt.” So my older daughter starts crying too, and says “No…Don’t give Jacie away”. Anyway, point for us because she stops crying, says she doesn’t want to be with another family, and will now listen to what we tell her to do. The cycle goes on for a bit, the crying and the tantrums, but we take the hard approach, and its working. She’s slowly coming to realize who the alpha dogs are. 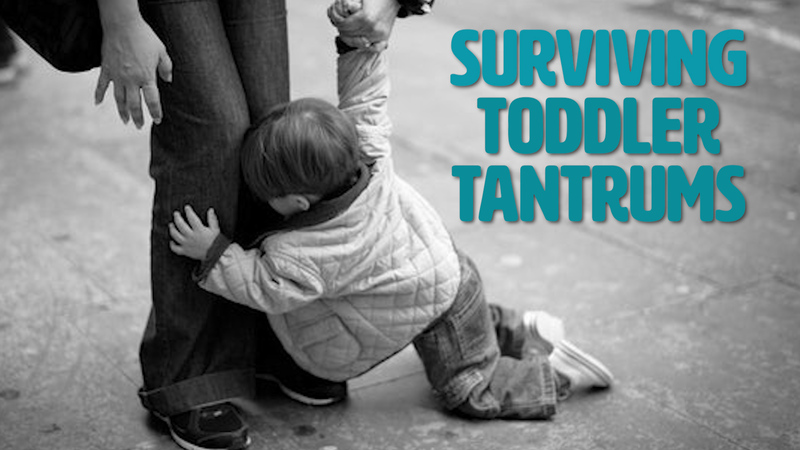 But one day, the tantrum comes out in full force. We’re all in the car, out running errands, and it starts; the crying, screaming, and wailing. So we tell her to stop, but she won’t; and in fact gets even louder. And this time she challenges us. She says, “I want a new family.” My heart starts pounding because it’s getting pretty tense. We finally get to the shopping center, pull in and park the car. We unstrap her from the car seat, and she’s kicking and screaming. So we put her down and slowly walk away, hoping she’ll calm down and follow after us. But she doesn’t follow. We take a few more steps away, and we can’t believe she’s not following after us! Okay, time out; before anyone calls child protective services, I want you all to know that it was never our intention to leave her. We just assumed she would follow. How many parents here have walked away from their child, expecting them to follow? But Jacie didn’t follow us. I had been expecting to hear her footsteps and see her running after us, but instead I turn around, and I see that she’s stopped crying, and is standing there looking at us like she knows she’s got us because she knows we’d never leave her nor give her to another family. And as I’m looking at my little three year old, I think to myself, Wow, did she just outsmart us? And then it hits me, that instead of disciplining her, our take it or leave it attitude has actually been making her more defiant. So we walk back to her, she won. But now I’ve realized that I don’t want to play this game anymore because neither of us will win. And while maybe “alpha dogs” isnt the right term I’m looking for, we do want to be leaders, and we know know now that I want that position because we’ve earned it; because she respects us and we teach her with love, not because we give her ultimatums and she fears us. I remember something a minister once said in a lesson, that we should discipline with love, and not anger. Even though it’s so easy to give in to anger and frustration. But children are a blessing from God, and we have to cherish them and protect them. And then I remember a verse I heard in a worship service that said, “Train up a child in the way he should go, and when he is older, he will not depart from it”. Train like a soldier, train like they’re preparing for a fight. But it’s not a fight against the family but a fight against the world; a fight for their faith. I have to train Jacie to respond with love, not anger. I have to train her to be patient and respectful. I realized that Jacie has been acting out because she’s insecure about how we feel about her. It’s not that she really wants another family; she says that because she thinks that we don’t want her. She’s rejecting us because she mistakenly feels we’ve rejected her. So now we’re on a new mission. The game plan has now changed. Our goal is to build her confidence in herself, her security in our family. So when we reprimand her, she won’t think that we don’t love her. She’ll know we reprimand her because we DO love her, and only want the best for her. And it all seems so clear now, because isn’t that how God teaches us? When we’re tested, or given something we don’t like, it’s not because He’s punishing us, it’s because He loves us; and He wants to make us strong, to make us more faithful. In the years that followed, our family came to an understanding. When we discipline her, we tell her we love her and clearly explain the expectations we have of her. And since she knows she’s loved, she can openly tell us how she feels, instead of acting out. We still have our ups and downs, and now she’s ten years old, so teenage years are just around the corner, so I’m sure there will be some skirmishes here and there. But the other night she was on her iPad and I asked to see her photos. It was all a bunch of life quotes she’s saved. And it all centered around being yourself. My favorite one is one she downloaded from incmedianews on twitter. The quote was a verse from Proverbs that said, “She is clothed with strength and dignity, and she laughs without fear of the future.” I read this, and It makes me hopeful for her future; that she’ll be strong and fearless because she’s driven by faith. And I know that if I want this for her, my husband and I have to be her examples in being driven by faith. If children see love, they learn how to love. If they see faith and devotion, they learn faith and devotion. And to teach our children devotion, we pray together as a family every night. We pray to always be guided by wisdom, and that every decision is guided by God’s mercy. We also pray that God will keep us close to him, and that if there are tests, we can be made even stronger. My own personal prayer for my children; that they always remain strong and fearless in faith. Jennifer Polintan’s story can also be found on incmedia.org/faithspeaks.